Another year has come and gone, which I find myself a little more disappointed by than usual, since I have a personal affinity with the number 17. Despite this discomfort, the promise of all that could happen in 2018 is enticing enough that I’m not only willing but excited to open my arms wide and greet the new year, along with all the potential visitors, workshop participants, tour groups, and residents who might find their way to Dancing Rabbit in the coming months. 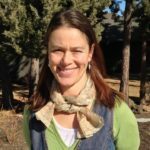 Danielle here, writing to you as the Executive Director for the Center for Sustainable & Cooperative Culture (CSCC) here at Dancing Rabbit Ecovillage. Before closing the book on last year, I find it a useful practice to look back and take inventory of what happened, lessons learned, and how we might approach the next year with even more wisdom gained from practical experience. I remember last winter at Dancing Rabbit when many Rabbits were away visiting family or friends, or working elsewhere during the colder months. It felt like a small, tight knit group was holding down the fort. However, hope was in the air, as several people had applied for residency and planned to move to Dancing Rabbit sometime in 2017. I myself remained optimistic even as the time between community rotational chores (cleaning the common house, humey shifts, re-stocking firewood) seemed quite short, due to the lower seasonal population. 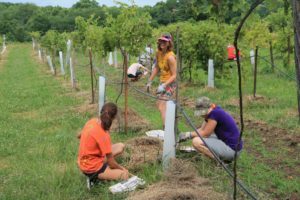 Hands-on experience in the vineyard during the 2017 visitor season. Photo by Deena Larsen. Sure enough, come springtime a handful of new residents took the next step on their journey toward living a more ecologically-conscious lifestyle by moving to Dancing Rabbit. The trend continued throughout 2017, with our most recent resident Cameron arriving in December, just in time to experience the first real winter we’ve had in a while. I can’t say enough about the good energy these dozen or so folks (plus their half dozen kids) have brought to the village. But since this is focused on the nonprofit, I’ll let the weekly update writers continue to tell you more about the vibrancy in the air. I do want to point out that every single person who became a new resident or member here in 2017 attended a Sustainable Living Visitor Program, which is offered through the nonprofit, and this year about half of our new folks participated in more than one CSCC program either before or after they moved here. This highlights for me a fundamental connection between Dancing Rabbit the village and the village’s nonprofit, CSCC. Almost all of our residents attend a visitor program before moving here, since it serves as an excellent orientation to how we live here, and is also a great way to gauge whether Dancing Rabbit might be a good fit. Six of this year’s new residents or resident-kids have also attended a Permaculture Design Course here in the past few years. 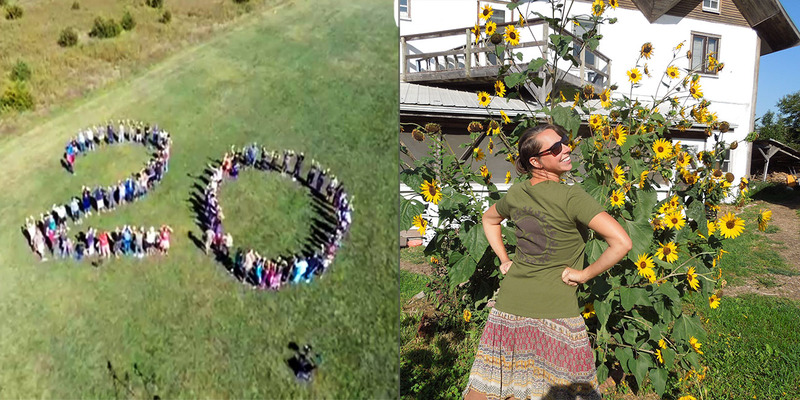 This is pretty remarkable, since we just began offering this program three years ago in collaboration with Midwest Permaculture (thanks to the passion of Dancing Rabbit member Sharon). The renown of this course has grown quickly, and we were delighted this year when every participant slot was filled for the PDC. I find myself personally excited by and curious about how the expanded awareness of permaculture might inform future village projects and undertakings at Dancing Rabbit, all with an eye towards “sharing the surplus”! For the first time in many years the nonprofit offered a natural building workshop at DR, and it was also a huge hit, selling out even before early bird registration closed! Hassan and Sharon led the workshop with ease and grace, offering an introduction to the fundamentals of building and wisdom from their personal experience, along with the opportunity to experiment with many different natural building techniques. The outcome was a sight to behold—beautiful walls inlaid with cordwood, decorative glass bottles, light clay straw, wattle and daub, and an exterior finish plaster looking as smooth as creamy peanut butter! A lot was accomplished in the few short days of this workshop, and it was such a hit that we’re offering another one in 2018. Another new CSCC program offered in 2017 was a workshop called “THRIVE: Inner Sustainability for Healers, Leaders, and Lovers of the Earth.” At Dancing Rabbit we know that a community cannot function at its best unless all its members are truly thriving—finding meaning, growth, and productive ways to handle life challenges. Living together effectively, sharing resources and decision making, requires self-awareness and the ability to consider the deeper levels of one’s own motives, intentions, and impact. I personally could not have lived in community this long myself (8 years) without the incredible tools I’ve learned through various inner sustainability workshops. These can strongly impact our personal development, self awareness, interactions with others, and ultimately the scope and quality of the difference we can make in the world. The THRIVE workshop was led by Laura Wolf, a fabulous facilitator and life coach from Kansas City, and I and many other Rabbits participated, making this CSCC workshop the most highly-attended by our own community mates in 2017. 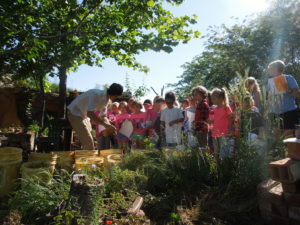 Kyle encouraging local public school kids to get their hands dirty and learn about natural building. Photo by Danielle. All of our workshops have a special transformative impact on people, but when the workshop ends and participants get to continue living near each other and supporting one another, the integration is enhanced. Daily relationships become infused with a new appreciation for the challenges, little personal victories, and depth of the human beings next to us. Thinking back to all the new folks who moved to Dancing Rabbit in the last few years, I feel a special sort of connection to them. Back when I was the Correspondent I read most of their visitor program applications, sent them their acceptance letters, and helped them figure out logistics to attend. It’s a special feeling to see folks applying for membership and buying or building houses here, and knowing that I played a role in helping them take the first steps toward living here. I sometimes miss serving as that point of first contact with people who want to move here or live this way, though as Executive Director I am still engaged in providing opportunities for more people to learn about Dancing Rabbit and come here, albeit in a more behind-the-scenes role. And Vick (our current Correspondent) does a stupendous job handling everything from transportation logistics for the visitor program to responding to the many emails we get every day, and I am grateful to have someone steady and reliable in this role. Speaking of which, the influx also led to some awesome new staff members for CSCC in 2017. Carolyn Bunge was hired as Development Assistant. Carolyn hails from Texas, and spent a year traveling to different communities and blogging about her experiences. We are fortunate indeed that Carolyn, her husband Matt, and their 2-year-old son Henri choose DR’s neighboring community of Red Earth Farms as their new home. Carolyn’s ebullience and willingness to learn anything give me a sort of excitement wondering what CSCC might take on next. Our own imagination is the only limit, folks! Melany Benoit is not new to CSCC, or to DR for that matter (her family first moved here in 2014), but she did move into a new position with the nonprofit in 2017. Melany was hired in spring as CSCC’s Development Director, handling all manner of fundraising, grants, and charitable giving. She is the engine behind our Give STL Day and Giving Tuesday efforts, and her ability to pick up not just new skills but a whole domain (involving backstage apps & interfaces that are, at best, bewildering) have impressed me wildly and earned her high regard in my book. Oh, and did I mention that she fits in her work amidst raising four awesome kids, the youngest of which just started walking? Hats off to you, Melany! Burl Smith came on board as our Administrative Assistant in the summer, when Melany vacated that position to fill the Development Director shoes. 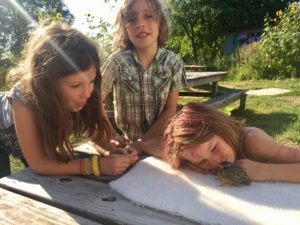 Burl moved to Dancing Rabbit in the spring, with her husband Troy and their 3-year-old daughter Ellie, after a journey to a number of intentional communities. I am so glad to have someone reliable, tuned in to her own heart, and genuinely passionate about cooperative culture assisting me with the myriad things that need doing in this organization! 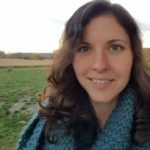 Samantha Jo Stolle is CSCC’s most recent staff addition, who’s stepped into the praiseworthy territory of website, communications, and messaging, including getting these words you’re reading (along with the nice pictures) formatted and into your inboxes and up on the web. Her willingness to jump in and master new skills is truly uplifting. 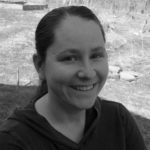 In addition to her web-savvy skills, Sammy Jo has a wide breadth of knowledge about plantlore, and a history of coordinating Kids’ Camps. 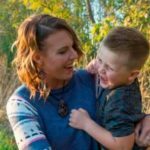 Sammy Jo visited DR three years ago, and attended the soap making workshop offered through the Milkweed Mercantile earlier this year, which led her to move here with her son Lennox, who often wows me with his communication skills (“Really, he’s only 5 years old?!”). Welcome to these four wonderful women, who join other nonprofit staff members Tereza, Kim, Vick, Brent, Nik, and Josi. The CSCC staff, along with our donors, members, volunteers, and board members, are the crucial ingredients that allow this nonprofit to function as a gateway and learning center for sustainable living, sharing the intelligence of living cooperatively. Emma, Max, and Althea with a feathered friend. Photo by Marge Becaud. I do believe, as we are more globally and technologically connected than ever, that the work of our times is to realize (or, see with “real eyes”) the interconnection, the “We-ness” that binds us together on this planet. Only then can we remember that we humans are all in this together, and are the only ones who can shift destructive, exploitative, inconsiderate human behaviors, risking our comfort for the possibility of an earth, a climate, a biosphere that is hospitable to other species, as well as our own great-grandchildren. As we continue to work towards climate change solutions by spreading cooperative, low-resource-use living, I want to thank you for all your choices in the past year that support the same fundamental value we hold here at CSCC: a livable and sustainable world for all. May 2018 be a year of abundant imagination that allows us all to dream new ways to uphold that basic value, even if it means being uncomfortable sometimes. My grandparent’s lived in Rutledge mo many years ago, it is now the Zimmerman dairy farm. I love Rutledge I use to spend lots of time on the farm and loved the openness there.